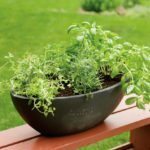 You may have a difficult time finding true tropical plants that grow outdoors in USDA zone 5, but you can definitely grow zone 5 tropical looking plants that give your garden a lush, tropical appearance. Keep in mind that most tropical plants that grow in zone 5 will need extra winter protection. If you’re looking for exotic “tropical” plants for zone 5, read on for a few great suggestions. Japanese Umbrella pine (Sciadopitys veticillata) – This tropical looking, low-maintenance tree displays lush, thick needles and attractive, reddish-brown bark. Japanese umbrella pine requires a location where it will be protected from cold, harsh winds. Brown Turkey fig (Ficus carica) – Brown turkey fig needs a thick layer of mulch in zone 5 to protect it from chilly temperatures. The cold hardy fig tree may freeze in winter, but it will regrow in spring and produce plenty of sweet fruit the following summer. Big Bend yucca (Yucca rostrata) – Big Bend yucca is one of several types of yucca that tolerate zone 5 winters. Plant yucca in a sunny location with good drainage, and be sure the crown of the plant is protected from excess moisture. Beaked yucca is another great choice. Cold hardy hibiscus (Hibiscus moscheutos) –Also known by names such as swamp mallow, cold hardy hibiscus tolerates climates as far north as zone 4, but a little winter protection is a good idea. Rose of Sharon, or Althea, are other varieties that will provide tropical appeal. Be patient, as the plant is slow to emerge when spring temperatures are chilly. Japanese toad lily (Tricyrtis hirta) – Toad lily produces a burst of spotted, star-shaped blooms in late summer and early autumn, when most flowers are wearing down for the season. These zone 5 tropical looking plants are great choice for shady areas. 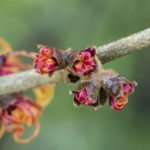 Jelena witch hazel (Hamamelis x intermedia ‘Jelena’) – This witch hazel is a hardy deciduous shrub that produces reddish-orange foliage in autumn and spider-shaped, coppery blooms in late winter. Canna lily (Canna x generalis) – With its huge leaves and exotic flowers, canna is one of the few true cold hardy tropical plants for zone 5. Although canna survives winter without protection in most zones, zone 5 gardeners need to dig the bulbs in autumn and store them in moist peat moss until spring. Otherwise, cannas require very little attention.